That's a nice picture! I like the RGB colors, of course! 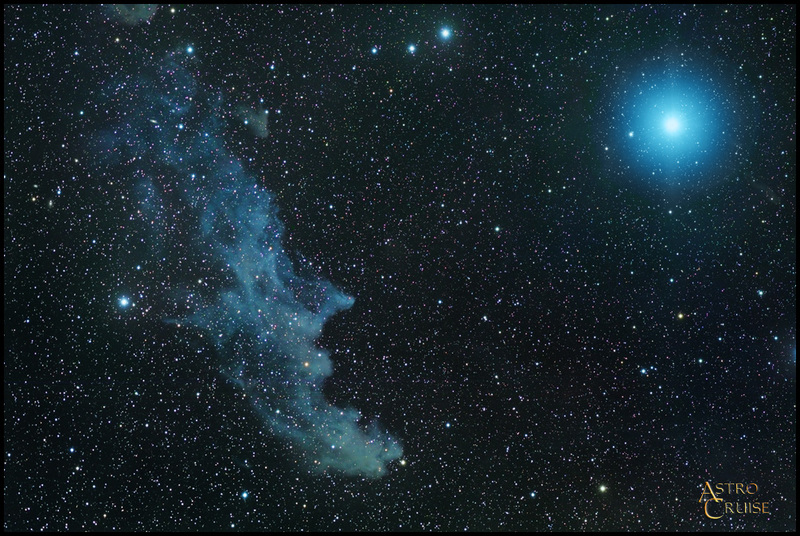 The Witch Head Nebula is illuminated by Rigel. The length of the Witch Head Nebula is about 50 light-years, according to the caption, and all of it is (presumably) illuminated by Rigel. Does anyone know how far away from Rigel the Witch Head Nebula is located? I find it strange that many parts of the Witch Head Nebula are as non-blue as they are. Some blobs are downright beige. What is the light source illuminating the beige blobs? Ann wrote: I find it strange that many parts of the Witch Head Nebula are as non-blue as they are. Some blobs are downright beige. What is the light source illuminating the beige blobs? Could it be that the two beige parts (at the 4 o’clock angle) have red nebulosity knots shining through? It is in the path, either behind or in front. I guess you’d have to examine the Hα component to be sure. What is the distance between Witch Head Nebula and star Rigel ? At least hundred of light years I suppose. Even at such distance Rigel's light can still be reflected by the nebula ? Compared to the post from Dec of 2006, the photo would appear to be upside-down making it a bit more challenging to see the witches head. When I look up Rigel in Wikipedia, it says 860 ± 80 ly. A similar look up of IC 2118 says "about 900" ly in the text and 1000 ly in the Observation data box. So... the nebula could be anywhere from 0 to 220 ly from Rigel. I think we can rule out the low end of that range Rob, since the nebula couldn't exist if it was 0 ly from Rigel! True. How far away must it be to exist? alex_555 wrote: What is the distance between Witch Head Nebula and star Rigel ? At least hundred of light years I suppose. Even at such distance Rigel's light can still be reflected by the nebula ? Rigel, also designated Beta Orionis (β Orionis, abbreviated Beta Ori, β Ori), is generally the seventh-brightest star in the night sky and the brightest star in the constellation of Orion—though periodically it is outshined within the constellation by the variable Betelgeuse. With a visual magnitude of 0.13, it is a remote and luminous star some 863 light-years distant from Earth. The star as seen from Earth is actually a multiple star system of three to five stars, the primary star (Rigel A) being a blue-white supergiant which is estimated to be anywhere from 120,000 to 279,000 times as luminous as the Sun, depending on the method used to calculate its properties. It has exhausted its core of hydrogen and swollen out to between 79 and 115 times the Sun's radius. It pulsates quasi-periodically and is classified as an Alpha Cygni variable. A companion, Rigel B, is 500 times fainter than the supergiant Rigel A and visible only with a telescope. Rigel B is itself a spectroscopic binary system, consisting of two main sequence blue-white stars of spectral type B9V that are estimated to be respectively 3.9 and 2.9 times as massive as the Sun, Rigel Bb may itself be a binary. Rigel B also appears to have a very close visual companion Rigel C of almost identical appearance. rstevenson wrote: True. How far away must it be to exist? Good question. But just from the image and the Explanation I'd guess that the separation must be > 60 light years. I think about 100 ly is a reasonable estimate. Thanks ! So Rigel's system is a big bulb in that corner of the galaxy. Bright enough to light up so distant clouds... Impressive ! dkklein wrote: Compared to the post from Dec of 2006, the photo would appear to be upside-down making it a bit more challenging to see the witches head. Actually, this photo is the correct way around, oriented about as Orion would be tonight at 9pm local time. The Dec 2006 APOD is upside down. I have observed this a couple of times with my 20" scope. It is subtle and very large - it requires panning the scope around a lot to trace out the outline - but it can be seen. I believe that today's image is "upside down" only in respect to it being a recognizable image of a witch's head. Catalina wrote: I believe that today's image is "upside down" only in respect to it being a recognizable image of a witch's head. There is a convention of showing astronomical images with north up and east to the left. And mirroring an image (e.g. north up east right) has a physical meaning with respect to visual appearance and is arguably a bad idea. But rotation is completely arbitrary. The rotation angle we see an object in the sky at depends on where we are on the Earth and what direction we're facing. Let's say the Witch Head Nebula is a hundred light-years from Rigel. If Rigel was a hundred light-years away from the Solar System, how bright would it shine in the Earth's skies? If Rigel was a hundred light-years away from the Solar System, how bright would it shine in the Earth's skies? Interesting, though. Venus is not all that bright in our skies. But apparently, Venus should be able to illuminate a reflection nebula in the Earth's night sky. Right?